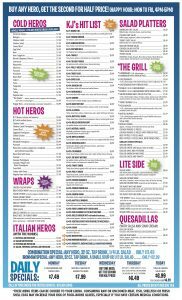 KJs Heros & Breakfast – A NY-style deli offering breakfast, lunch and catering. 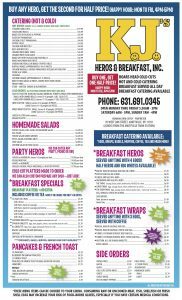 KJs Heros & Breakfast is a well-loved neighborhood NY-style deli serving breakfast and lunch to the local community AND catering all occasions across Long Island and the nearby boroughs. Also, be sure to review our catering options for your next event. Some crowd favorites are our Mac and Cheese (gooey!) and our Chicken Fingers (crunchy!). And if you are stopping by, remember to look for our chalkboard outside the front door with an inspirational saying for the day from Ironman proprietor John Coffey (the “J” in “KJs”).